Click This | Nature Photography News Around the Web, March 2011. Canon 200-400mm lens. One lens all my friends who shoot Canon gear have been lusting over for a long time, finally announced. A 200-400mm F4 lens – “Designed for Canon’s leading range of EOS Digital SLR cameras, the new lens will be an ideal addition for sports and wildlife photographers, offering exceptional flexibility with a built-in 1.4x extender that creates an increased focal range of 280 – 560mm.”. Have at it, folks, I’m sure this will be a popular piece of gear. Amazing Mountain Lions. How many wildlife photographers would love an image of a mountain lion? how about a photo with 8 mountain lions in it. All wild. Check this out. Quote #1: “In the tension between light and dark is the power of the universes”. Peter Matthiessen, The Snow Leopard. Most Surprising Photos of 2010. TIME Magazine displays a great Photo Essay, 21 photos from 2010. Some great stuff. #5 will blow your mind. Yikes! #13 is pretty amazing as well. Greater Yellowstone Ecosystem A Photo Essay. – “a generally intact ecosystem; all the wild critters that were here a couple of centuries ago when Lewis and Clark passed through the Northern Rockies – wolves, grizzly bears, bison – are still here.” Dave Showalter has some nice stuff here, on the NRDC’s website. Good work. Aurora webcam. A webcam showing auroras. Useful tool for folks wanting to go out and maybe see or shoot the lights. Facebook Changes. Recent (again) changes to Facebook are reviewed here on the Photo Editor website. As with everything to do with “the Face”, seems like every rose has its thorn. Photo Tips. Bret Edge puts a nice post on his blog with some helpful reminders to improve our photos. Excellent advice. Nice discussion follows the blog. Sweep the edges of the frame! Customizing Facebook Pages. This guy did it. Nice job, too. Photoshelter blog present Nathan Armes’ work on customizing his facebook page. Will be interesting to see if this catches on. Here’s Nathan’s Facebook page. Gmail users Some helpful hacks and tips to make gmail even more user-friendly. Gmail is the bomb. With these tips and tricks, gmail rocks even harder. For example, a link to the official gmail keyboard shortcuts page. eg. Click ‘J’ to open or move your cursor to the next oldest conversation. Quote #2: “In art as in life, form and subject, body and soul, are one.” – Ed Abbey. Canabis and Psychosis. Scientific America publish an article about an upcoming paper; “This particular study found that marijuana use is associated with early development of psychosis.” Put the pipe down, kids. Internet Explorer 9.0. Website updates all around, I suppose. What else can this mean? “Microsoft’s Internet Explorer 9 web browser goes live”? As someone doing my own website work, I shudder everytime I hear anything about Internet Explorer. I hope it dies a slow painful death. Free Hugs. This is pretty cool; a moving video of people offering “Free hugs” around the world. Seriously folks – Watch this clip. A cow moose, Alces alces, stands outside a house, Anchorage, Alaska, winter. I shot this leaning out the window, with a 12-24mm lens. 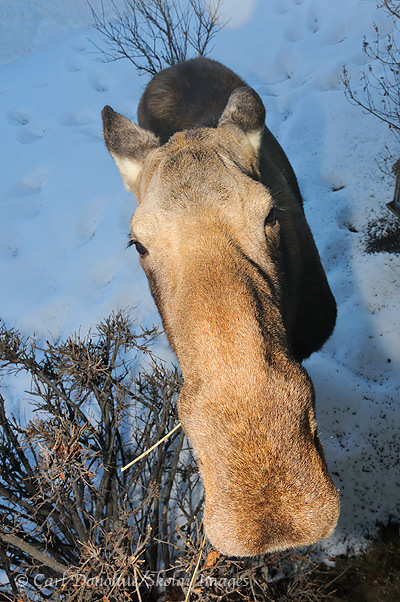 That's up close to a moose. Extinctions lost. Interesting read (by Richard Conniff) on the science of species extinctions. We forget that only a short while ago people didn’t actually believe an entire species could be wiped off the earth’s face. I wonder if the remaining deniers of evolution are simply holdovers from this earlier idea. Ocelot in Arizona. This is a cool story. An all too rare ocelot spotted (clever pun) in the Huachuca Mountains in southern Arizona. Now we just have to Arizona Fish and Game don’t kill it. Seriously, though, great news. Wolverines and Climate Change. “The new study shows that climate change might endanger wolverines in the mainland U.S. by eliminating springtime snow and significantly increasing summer temperatures.” Article in Nat Geo on wolverines and climate change. Serengeti Highway.“A proposed two-lane road across the northern edge of Serengeti National Park in Tanzania would block the migration of 1.5 million wildebeest and threaten endangered species, according to a leaked government report.” E360 Yale have the item here, with all the links you need to follow it up. Orcas and Grey Whales. Heavy duty – “Up to a third of Eastern Pacific grey whale calves born each year are eaten by orcas that prowl the tip of the Alaskan Peninsula”. Orcas are amazing creatures – fascinating read. Amur Tigers. Amur, or Siberian Tigers, are in a crisis, apparently. “The effective population of the critically endangered Amur tiger is now fewer than 14 animals, say scientists. — Approximately 500 Amur tigers actually survive in the wild, but the effective population is a measure of the genetic diversity of the world’s largest cat.” BBC Earth news. Playing God. Peter Gleick writes, on the subject of intentionally permitting a species to go extinct if an argument can be made that it will somehow help other species survive; “killing off a species of animal, or bird, or fish in the name of economic gain is reasonable, including legislators trying to weaken or destroy the Endangered Species Act .. is a moral, ethical, and political outrage”. SFGate article. “The Limits of Laws as a Conservation Tool” Andy Revkin replies to the above here. “it’s pretty clear that this century will, in many situations, unavoidably see a shift away from “saving” species to conserving ecological function and diversity.” Recommended reading. EPA Considers Pebble Mine. At long last – “The federal Environmental Protection Agency said Monday that it will review the consequences of large-scale development projects, such as the proposed copper and gold Pebble mine, in the Bristol Bay watershed.” Good news but I doubt it’s good enough. Pebble Mine is a disaster waiting to happen – ADN article. Gorilla Twins. More good news; “Twin mountain gorillas have been born in Volcanoes National Park in Rwanda …. only the fifth set of twins ever recorded in the history of Rwanda’s mountain gorillas.” More importantly, apparently the population of this species is increasing, almost doubling in the last 30 years. Cradle of Life. “Two dozen chemists, geologists, biologists, planetary scientists and physicists gathered here recently to ponder where and what Eden might have been”. Great article in the NYTimes. Dude, wow … some cool stuff in this post. 8 Mountain Lions! 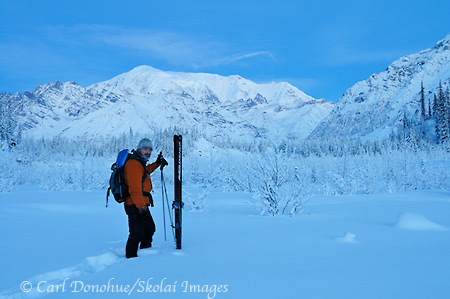 Love the picture of the backcountry skiing – wish I was there! Thanks man .. yeah, that mountain lion thing is amazing. I can imagine the photographer’s reaction when he saw that shot.